Paytm, India’s most popular digital payments portal has introduced a new mode of making payments offline called the Paytm Tap Card. This is an NFC (Near Field Communication) based offline payments solution that has been introduced in alliance with Yeldi.com. 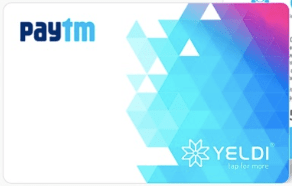 Yeldi.com is a digital payments company. After renovating its app Paytm has now launched a new payments solution, Paytm Tap Card. Paytm Tap Card uses near-field communication (NFC) technique to make safe and convenient digital payments, completely offline at Paytm-issued NFC PoS terminals, in within a second. We the team PromocodeClub always two step ahead to give you the fastest information. A user, who has some credit in his Paytm wallet, however, do not have access to the internet, can scan the QR code on his Tap Card in order to send money to it. After that, at any of the merchant shop, his Tap Card will be scanned through an add value machine (AVM) that uses NFC mechanism in order to extract payment. If this card already has the money balance, he doesn’t even need his phone during the transaction of payment. In order to make this work, Paytm is also issuing company-authorized Point of Sale terminals (PoS) that traders need to place in their shops. Paytm is partnering with educational institutes, events companies and corporates for rolling out the Tap Card payments. That being said, earlier in 2015, Paytm had introduced a QR code-based offline payment solution. When you did not think about online payment system, at that time Paytm were launched the online payment system. Now Paytm has been launched the offline payment method called Paytm Tap Card. You can pay and shop from any outlets at anywhere without using the Internet. Paytm is also partnering with different events, educational institutions and corporates in the starting phase to enable quick digital payments using this tap card. Kiran Vasireddy, COO of Paytm told, “We are aggressively pushing digital payments to users from every turn of life. There are a large number of people who at times do not have access to the Internet or they have a limited daily budget for internet so they keep away from using online payments. For those people, we offer the Paytm Tap Card to enable seamless offline payments. For ensuring a large acceptance, we are also reaching out to the merchants, shops, outlets and are actively enabling them with NFC PoS terminals to accept payments without Tap Card. This is a true testimony of our commitment to understanding the requirement of our users and creating innovative solutions around it”.